Lite Brite Neon office manager Cookie Brindle inspecting a work for artist Glenn Ligon. 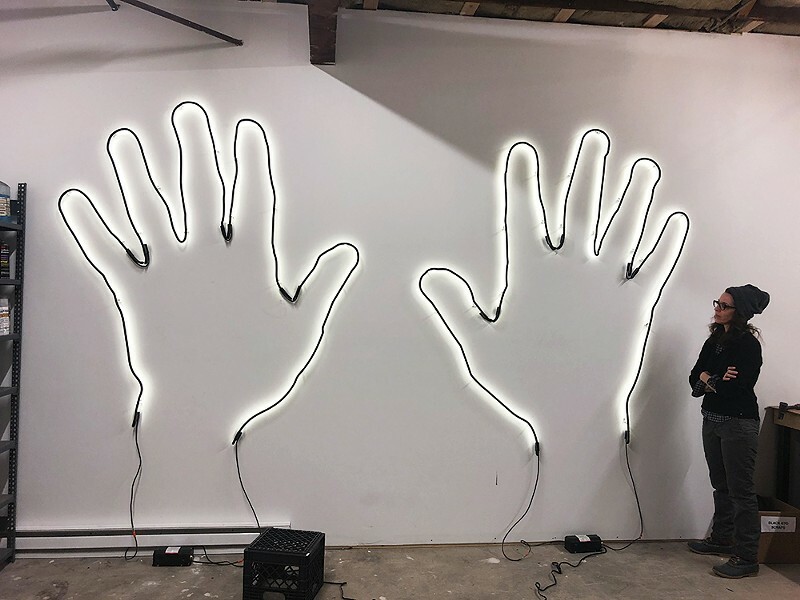 The history of neon can be traced back to the exuberant experimentalism of the Victorian Age, when inventors like Heinrich Geissler and Nikola Tesla made great advances in scientific, medical, and technological knowledge. Among these breakthroughs were the isolation of a category of elements known as noble gases—neon, helium, krypton, argon, xenon, and radon—and the discovery that when a high-voltage current is applied to the gas in a sealed tube, the gas molecules emit light. This magical illumination inspired the phrase "liquid fire." The first neon sign was introduced in the US in 1923, hawking a Packard dealership in Los Angeles. Neon lighting quickly became a popular fixture in outdoor advertising, enjoying a heyday in the 1950s but gradually losing ground to municipal ordinances banning the signs and the introduction of cheaper LED bulbs. 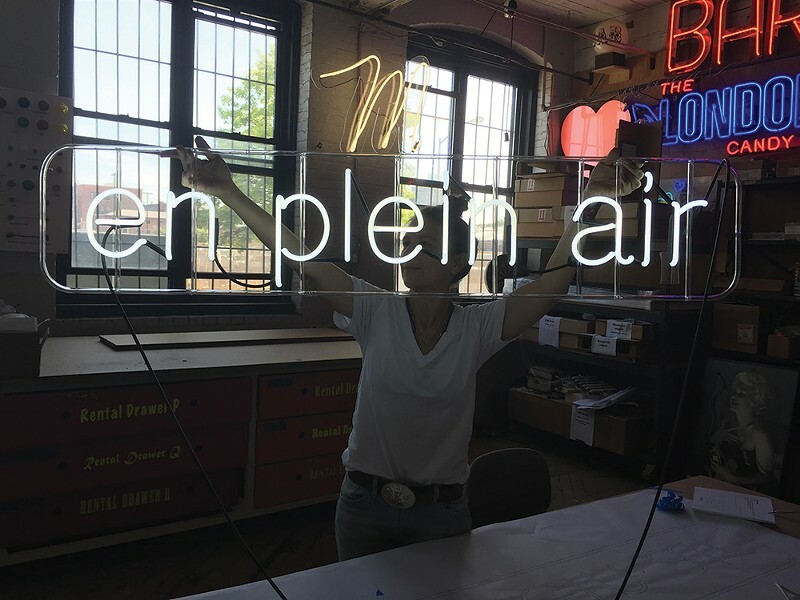 Today, neon is remembered as an iconic part of the 20th-century American design vernacular, but few new pieces are being made. 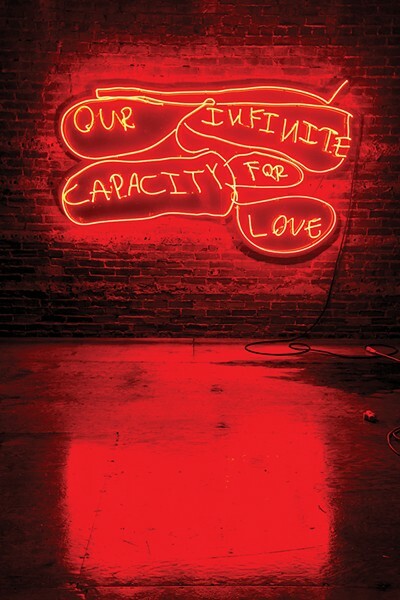 An exception to the rule is Lite Brite Neon, one of a handful of artist-quality neon fabrication studios currently operating in the US. 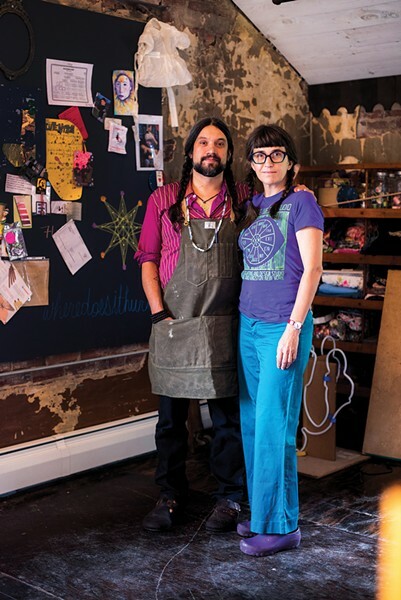 Lite Brite Neon Studio's founder Matt Dilling with his partner Erika DeVries. 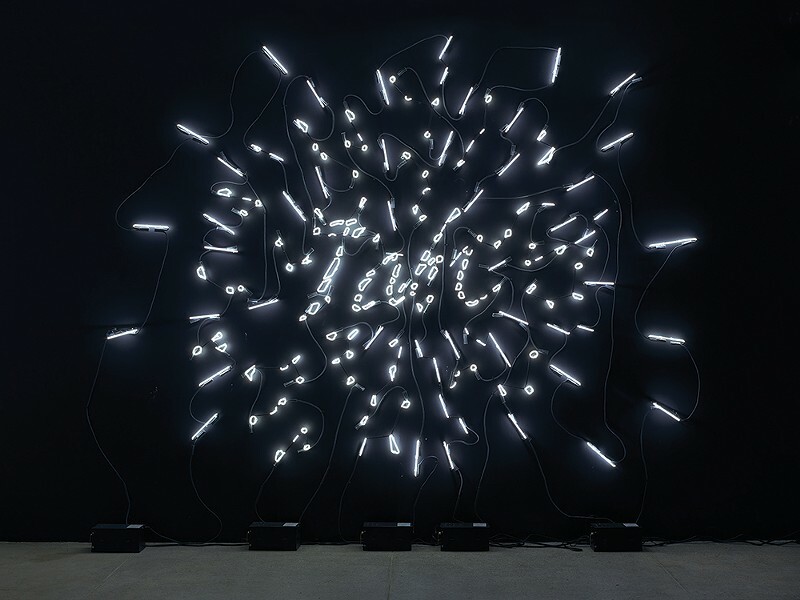 Francois Morellet's "No End Neon," 1990/2017. 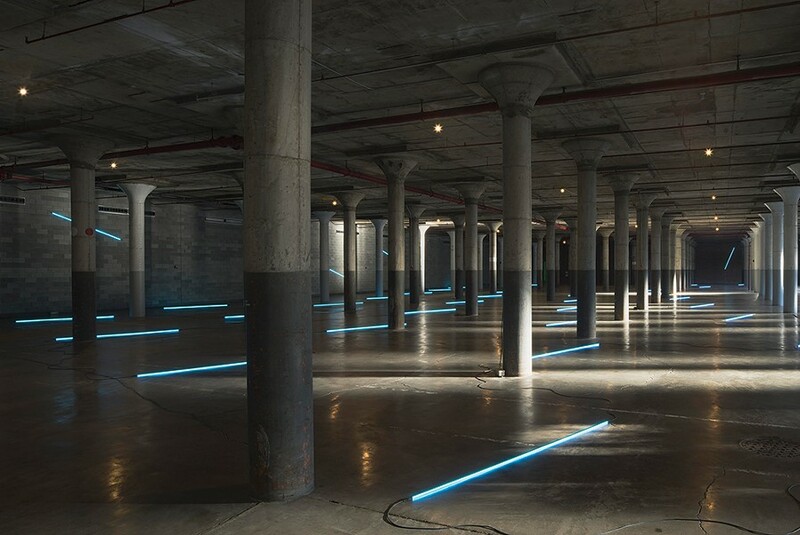 Dia:Beacon, Beacon, NY. © Arists Rights Society (ARS), New York/ADAGP, Paris. Courtesy Dia Foundation. Photo by Bill Jacobsen Studio, New York. Fabricated for Morellet by Lite Brite Neon Studio. "en plein air," for Beacon-based artist Robert Brush. 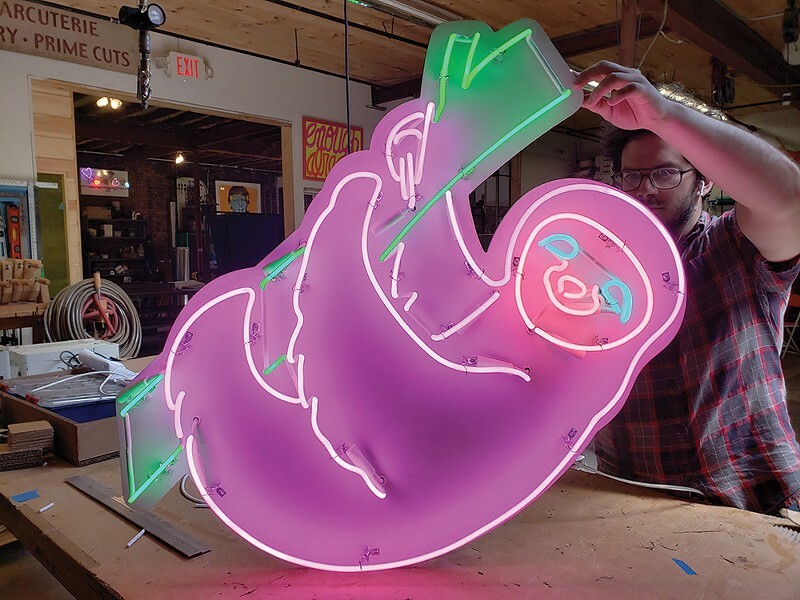 Custom neon sloth for a private client. 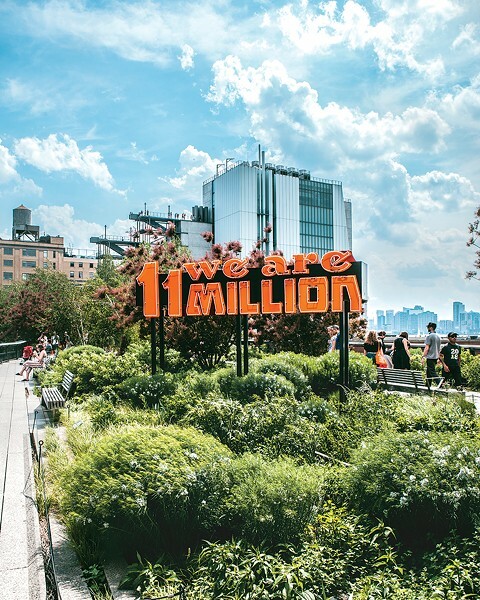 "Somos 11 Millones/We Are 11 Million," Andrea Bowers in collaboration with Movimiento Cosecha, on the High Line in New York City.